A meal right off the menus of Michelin-star restaurants, Alaskan King crab legs make for a fancy dinner at home, when coupled with sides like baked potatoes, crusty bread, fresh salad greens, and a crisp white wine. 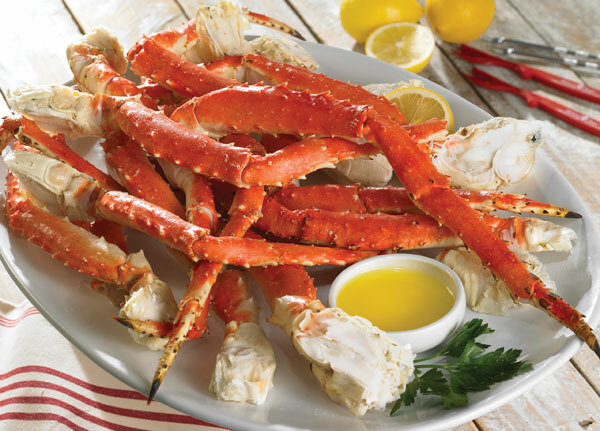 Unless you are purchasing a live crab, the King crab legs you buy will be pre-cooked by the seafood processor – all they require is seasoning and heating through. Start by lining your crab legs onto the roasting pan. Keep laying them on until the pan is close to half-filled. Do not worry about even cooking or the distribution of heat – since the legs are already pre-cooked, you do not need to worry about the danger of consuming raw crab meat. Since the legs will be frozen, you will need to thaw them out first. Cover the pan with foil, and slide it into your refrigerator to thaw overnight. Place the pan on the top-most rack in the refrigerator (it tends to be warmer up here), and make sure the pan is completely covered – crab meat is delicate, and you don’t want it to pick up odd smells from any of the other foods in the refrigerator. Once the crab legs are thawed, and you are ready to begin boiling the legs, preheat your oven to 400 degrees F. Meanwhile, take the roasting pan containing the crab legs out of the refrigerator, and set it close to the oven, in order to gradually introduce it to the heat. While the oven is heating up, place a large stockpot on the stove over high heat. Pour in a gallon of water, and add in the lemon juice, garlic, and salt. Bring the water up to a rolling boil. Once the water reaches a boil, it is time for the tricky part – you will be handling boiling water, so make sure you are extremely careful, and have someone around to help. Proceed to open your oven door, and slide the middle rack out a little more than halfway. Place the roasting pan with the crab legs onto the rack. Then, slide on a pair of heavy-duty oven mitts, pick up the stockpot filled with boiling water, and pour the boiling water into the roasting pan containing the crab legs. Push the rack back into the oven, and allow it to heat up for around 7 minutes. Once the time has elapsed, turn the oven off and carefully take the roasting pan out, using your oven mitts. Drain the water from the legs, crack them open using your preferred method, and serve on a large platter, with lemon butter for dipping.